Easter is here again and CasinoLuck is celebrating this with their own CasinoLuck Easter Calendar! You can read all about the Easter Calendar here! Not surprisingly, Easter is here again and CasinoLuck is celebrating this with their own CasinoLuck Easter Calendar! From today, CasinoLuck is going to be running daily promotions up until the 1st of April 2013. Some days you will need to make a deposit or play a certain game, and some days you will receive a gift for doing, nothing! 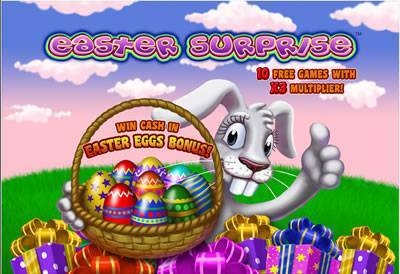 How to enter the 2013 Easter Calendar: Sign up below if you do not yet have an account at CasinoLuck. Follow the instruction below for each Calendar day (if any). Have fun and Good luck! March 27: Easter Egg present for all real money players. Check your email! March 28: Play at least 100 real money rounds today in any slot and you will get 20 free spins in Wild Turkeys after 15:00 GMT tomorrow. March 29: Make a deposit of at least $£€ 20 today and you can win an iPad Mini. March 30: Play at least 100 real money rounds today in any slot and you will get 30 free spins in Starburst after 15:00 GMT tomorrow. March 31: All players who deposit at least €200 today will get a €50 bonus tomorrow. The deposit must be turned over at least 5x in slots. April 1: Easter Egg present for all real money players. Check your email for more information. Check out the terms at the website! Let’s have a smashing Easter holiday together! Flowers Is Game Of The Week With 25 Free Spins! Can It Be True? Even More New Omni Games!